"Season Seven of Degrassi: The Next Generation ventures into new and more provocative territory for adolescents and young adults, as it picks up in the middle of a school year already riddled with tragedy. "A fire at rival high school Lakehurst forces many of its students into the halls of Degrassi with explosive results. Amidst the newfound clutter and chaos, Spinner and Darcy (Grimes) deal with dark, personal tragedies, Jimmy and Ashley test their love, and Emma (McDonald) and Manny (Steele) explore new, surprising relationships - all while hurtling toward graduation." “A critical and popular success," as Echo Bridge Entertainment President and CEO Michael Rosenblatt notes, the show, "is one of the most-watched teen dramas on television exploring topics and issues faced by teens everyday." Stating that, "Echo Bridge is proud to bring this latest installment of the Degrassi series to fans," the Complete 7th Season arrives in a four-disc set ideal for collectors and fans as it includes "all 24 uncut and uncensored episodes." 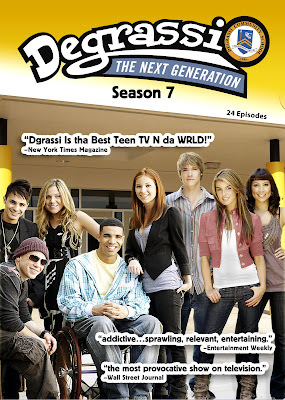 Degrassi: The Next Generation, which airs on the “The N” in the US, ranked number one with US teens (P12-17) and female teens (F12-17) in its time period among all broadcast and ad-supported cable television. Season Eight is currently airing on “The N” Friday nights at 8 pm.